Free Shipping Included! 2 Pack 12''x24'' Blank Car Magnets by Visibility Signage at Community Frontiers. MPN: 12x24magnet. Hurry! Limited time offer. Offer valid only while supplies last. 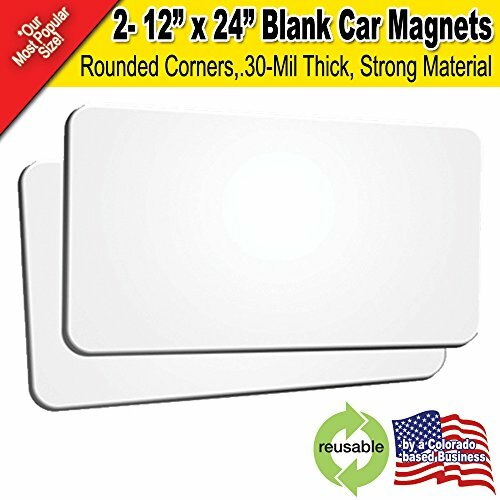 Customize your own business today with this 2 pack 12x24 inch blank magnets. These are inkjet printable with solvent, eco-solvent, UV and latex inks! Customize your own business today with this 2 pack 12x24 inch blank magnets. These are inkjet printable with solvent, eco-solvent, UV and latex inks! Or customize yours with permanent markers. Use these super strong magnets for children's crafts by cutting into smaller sizes! The Magnet back is coated to protect your vehicle finish and will stay on even at driving speeds! Advertise everywhere you go! Great for covering up Work Truck decals in subdivisions with Home Owner Associations! Magnet sheet for car Create your own business sign easily! View More In Store Signs. If you have any questions about this product by Visibility Signage, contact us by completing and submitting the form below. If you are looking for a specif part number, please include it with your message. Gardener Wanted Aluminum Metal Sign, Black 12"x12"